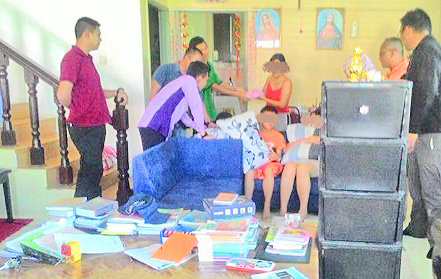 LIMBANG Police and the Social Welfare Department officials coming to the rescue of three siblings still in fear and trauma yesterday. LIMBANG: A police team and staff of the Limbang Social Welfare Department (SWD) managed to save three siblings who are victims of abuse by their own mother. According to Limbang police chief, Superintendent Mohd Bukhori bin Saffai, acting on information received from the Chinese community leader in the area, police team together with Limbang SWD entered the family home in Kuala Berawan Baru Limbang on Tuesday afternoon. They found the three siblings, respectively aged 10, 12 and 14 years were locked up in their house. The twelve-year girl was found with bruises on her thighs, while two others suffered mental abuse. The poor children were locked up in the house and not allowed to go to school for the past two weeks. Therefore, their mother, aged 35, who was in the process of divorce, was remanded for four days. At the same time, she also will be referred to the hospital for medical examination to determine whether she is suffering from mental health problems. The case is being investigated under Section 31 (1) (a) of the Child Act 2001, Mental or Physical Abuse Against Children. Meanwhile, the SWD is also seeking a court order in Miri for the process of sending the three siblings involved to Child Protection Centre in Kota Kinabalu Sabah or to a member of their immediate family. Three siblings rescued from further abuse by mom 0 out of 5 based on 0 ratings. 0 user reviews.